If ever there was a chance to see how enjoyable and accessible modern poetry can be, it was at the summer Settle Session at The Folly. Cumbrian Kathleen Jones has made her name as a biographer, notably of Katherine Mansfield and the Wordsworth's women. 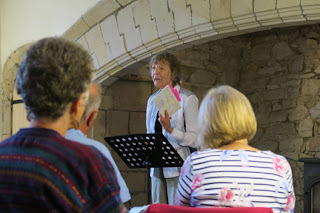 On this occasion, her poems conjured up heartache at the departure gate, the angst of being sixteen, and the life - and death - of the Brontes around the Yorkshire moors. The audience was spellbound by the evocative portraits she paints. 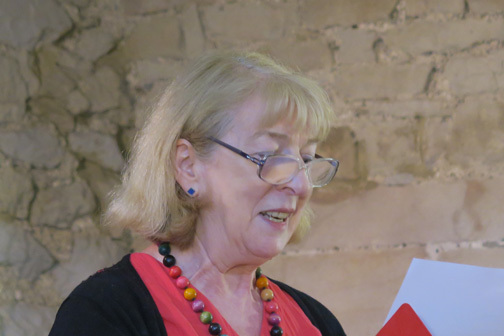 A founder member of Lancaster's April Poets, Ron Scowcroft, like Kathleen, has a string of prizes for his work. It's easy to see why in both cases. 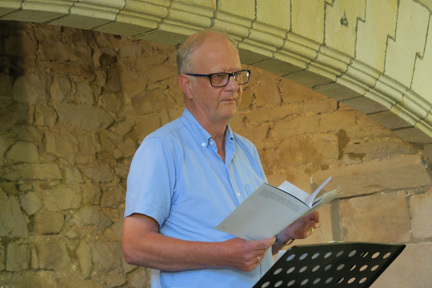 From Portugal to his father's phonograph, he brought humour and humanity; his poem on the plight of refugees was moving, as his recollection of chatting to David Hockney was funny. Irresistible elephants were the subjects in the 'Read Two' open slot with Jean Stevens reading six poems from 'A Poetry of Elephants'. This anthology was produced to raise funds for wildlife and habitat protection in East Africa. The images by various poets were amusing, affectionate, heart rending, and always engaging. Settle Sessions claims to have stories and poems for everyone. These were delivered in spades.